As people get older, they are more likely to take multiple medications. Unfortunately, the use of many medicines means that the possibility for mistakes and complications arises. 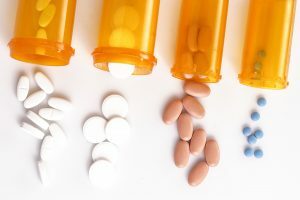 The Centers for Disease Control and Prevention (CDC) says that adverse drug events account for 1 million visits to the emergency room each year. Fortunately, caregivers can help older adults to avoid dangerous medication errors. Below are some common medication dangers and ways that caregivers can prevent them. It’s easy to forget having already taken a medication, which can result in taking a second dose. This may lead to an overdose. The FDA reports that they receive numerous reports of overdoses on over the counter medicines, like acetaminophen. Overdoses of acetaminophen can result in damage to the liver. Caregivers can help avoid medication overdoses by keeping track of when medications are taken. Keeping a written record may be especially helpful when dealing with seniors who have cognitive issues. The senior can refer to the record or the caregiver can show it to them to remind them that the medication has been taken. As easy as it is to forget a medication has been taken, it’s just as easy to forget to take it. Missing doses of medications can result in the worsening of symptoms. Sometimes people try to get back on track by taking two doses of the medicine. Depending on the drug, this could be very dangerous. Caregivers can help avoid missed doses by reminding older adults when it is time to take their medicine. If a dose is missed, a caregiver can read the instructions that came with the prescription or contact the pharmacist to find out what to do. Many drugs can interact with other medications or cause side effects. A drug interaction occurs when one drug affects how another drug works, perhaps making it stronger or weaker or causing an unexpected result. Prescription medications can also interact with certain foods, alcohol, or supplements. Side effects are problems caused by a medication, similar to a health condition, such as dizziness or headaches. Caregivers can help by monitoring reactions to medications. If serious side effects occur, a caregiver can call for emergency assistance. They can also help avoid interactions by reminding older adults to avoid foods that may interact or by notifying doctors and pharmacists of medications the person is already taking. One of the best ways to avoid problems related to medications is to stay organized. Create a list of all medications, supplements, and over the counter medications the older adult is taking. Take this list with you when going to the doctor or picking up a new medicine from the pharmacy. Also, make use of pill organizers and keep a log of when medications are taken.